Can Your Social Media Strategy Really Boost Your SEO (Rankings)? If you want to know what is popular and relevant right now then you have to use social media to find out, it's where the world gossips. What's being talked about, good or bad, is going to be on Facebook and Twitter. In the content of this article I'm assuming you already have a social media strategy and are building it into your brand marketing, using it to react to what is being talked about in your niche in real time. If you don't use social media and you're not building a brand then you had better go straight to jail without passing go or collecting £200 (or $200 if you're playing Monopoly outside the UK). One belief many people have that stops them having a social strategy is that social networking has no benefit for their search engine optimisation strategy. They would rather focus on organic search engine traffic. And if you ask 10 experts whether social media impacts SEO, you will get 10 different expert answers. So does social media impact on your SEO, and if so how can you develop a strategy for it to do just that? What Elements Of Social Networking Could Affect SEO? When it comes to the expert opinions, they are completely divided on the impact social signals can have on your Google rankings. Some will point to industry reports, such as SearchMetrics SEO Ranking Factors Report, and show you that seven of the top 10 ranking factors in that report included social signals. But then other experts point to Moz's Search Engine Ranking Factors Report where the data suggests that correlation does not equal causation. I'm going to nail my flag to the mast and state that the truth is somewhere in between. Direct social signals, such as volumes of tweets, retweets and Facebook likes are never going to be part of the future. They are too easily gamed. But where I think social signals can directly affect rankings is through establishing and building trust. This links in to trying to establish a brand for yourself. Branding creates trust with Google and by demonstrating quality through social media accounts that link to your branded websites, I think in the future, if not now, high quality social media accounts can affect the trust, and therefore the ranking, of the main site. How Else Can Social Media Potentially Benefit SEO? There are several indirect ways that social media can positively affect the rankings of your site. You may not have considered how these can work, so I will run through the main ways here. Quality activity on social media helps to increase awareness around your brand. Awareness leads to familiarity, which leads to trust. Once people trust you they are more likely to share your content. Some of these people will be inspired by your content to create their own, and if they are honest they will link to you within it when they reference a point you have made. Quality engagement on social media can also lead to people contacting you to guest blog for them, or for an opinion from an article they are writing, both of which can build links. Google+ users are given more personalised search results when they are logged in to their account. If you are using social media to link with that person then the result is that you are possibly going to rank more highly in their search results because of that connection. High quality engagement on social media can increase visitors to your website. When people visit your site via Google search it can result in a higher ranking because Google recognises that more people are looking for your site, which Google trusts. You will also build trust with Google, and therefore your search engine rankings, if you demonstrate that people are staying on your website and engaging with it. By building traffic through social media you are sending interested people to your website. This can lower your bounce rate, increase page views and time spent on site. The better these metrics are, the more your site could benefit in organic search. On a side note, if your site is a fast loading, responsive design then you will also benefit from a small rankings boost due to good site load times and being mobile friendly. How Can I Use Social Media To Improve My SEO? Like linkbuilding, a social media strategy with the goal of improving your search results can never really be called "optimisation". What you are actually doing is trying to build signals to your website that Google will see as positive votes for the quality and relevance of your site, with the reward being a higher ranking. So when it comes to social media, how can you develop a strategy that targets SEO improvement? Well, we've already covered how briefly above. High quality engagement on social media will build trust, which will lead to natural link building, better quality traffic and sharing of your content. There are ways you can help to improve your chances of this, through targeting who you follow. Let's look at a quick example now. Let's say your niche is health and fitness. You want to improve your engagement on social media with people who are likely to undertake actions that can boost your SEO. This means you are looking for people who are active on social media and highly interested in health and fitness. 1. Find a large and highly targeted Twitter account in the health and fitness niche. 2. Create an account on Followerwonk.com (part of Moz.com). 3. 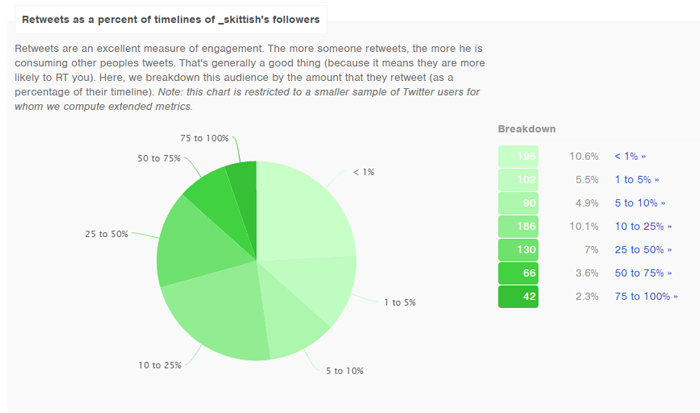 Use Followerwonk to get detailed data on all the followers of the account you targeted. 4. Download the data as a spreadsheet. From there you can look at things such as how often people retweet tweets from the target account, what their following count is, and what their follower count is. 5. Filter the spreadsheet to only display Twitter users who retweet the target account frequently and who have good following rates. 6. This will give you a list of people who are actively engaged in the exact niche you want to target, who are happy to retweet accounts they follow, and are likely to follow you. 7. Use your own Twitter account to add high quality content to your tweets and then follow the people you targeted. Now this method is obviously only one of many, and is not perfect. But it will allow you to target people who are more likely to engage with you and demonstrate behaviours to Google that can improve your search engine rankings. Social media activity can influence your rankings in the same way that linkbuilding can, and in many ways influence them in a superior way to pure linkbuilding. This article is not everything you will need to develop a complete social media strategy, but hopefully it has shown you how important it is for more than engagement. If you would like to discuss developing your social media marketing, then drop me an email or give me a call and we can have a chat. As a final thought, you always have to look to the future and try and predict it when it comes to Google. Social media isn't going away. It is only going to get bigger. This means that even if Google is unsure how they are going to do it now, in the future social signals will affect rankings more and more. Older PostWhich Social Media Platforms Should You Use?